I’m excited to be starting a new series here on Baubles to Bubbles! This is actually something I’ve been wanting to do for probably four years now, but just never got around to starting it. I’m a huge perfectionist about my blog and I tend to overanalyze how I want things to look to the point that I don’t end up executing it. It’s been something I’ve struggled with throughout my blogging career and something I’m trying to work on for 2019! Colors of my Closet stemmed from the comments I always receive from people regarding my wardrobe. As you know, I tend to wear a lot of color and other people seem to take notice! It always makes me smile when people tell me they love my colorful pieces or that they wish they could wear color like I do. I always tell people that they can wear color and that it’s not as intimidating as some people think! That’s why I thought it would be fun to each month pick a different color or pattern and highlight the pieces I have in my closet and how you can wear it. Whether it’s dresses, tops, pants, skirts or accessories, I have a color for every occasion and I’m hoping it’ll get your wheels turning for incorporating some color into you closet! To kick things off I went with red. I thought a lot about what color to do for January and I thought red was good with Valentine’s Day coming up. Although red can also be very heavy during December I still think it’s a great color to wear in January. The weather is so blah so I think red can instantly elevate your mood despite the chilly temperatures. Every woman needs a piece of cashmere in her closet. It’s timeless and adds a hint of luxury to your look. 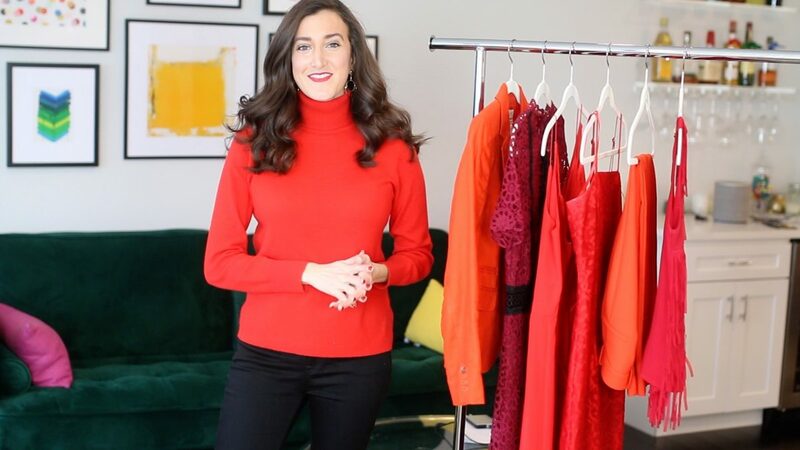 This red cashmere turtleneck is from J.Crew and I cannot recommend it enough! This red blazer was a J.Crew find at least five years ago. I adore their blazers because they’re timeless and fit so well! This red maxi dress was my introduction into the maxi dress world. The bold red color just called my name and I loved the fit. Looking forward to summertime so I can wear it again! This red lace dress from Milly (on sale now!) is probably my favorite red piece that I own. The lace pattern is actually comprised of lips, which is a cheeky detail I love! This dress is perfect for a wedding or formal event. Trousers have become an obsession of mine and I can’t get enough. When I need to get dressed and don’t want to put in a lot of effort I instantly reach for my trousers. They elevate your look and make you more put together than more casual pants! This pair is from J.Crew and I love them!